Helena Michael (40), mother of seven children. 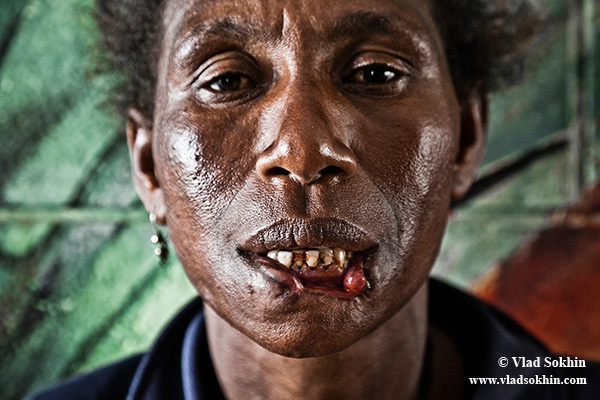 On December 27th (2011) she was attacked by a “cannibal” near the Boroko police station, in the central part of Port Moresby. The attacker bit off Helena’s lower lip and wanted to sink his teeth into her throat. The woman managed to escape by kicking her assailant in his testicles and biting three of his fingers forcing him to release her. Police arrested the man and found out that it was his third attempt to eat human flesh. Having spent three days in hospital, Helena went to the police station to initiate criminal proceedings against the cannibal, but discovered that he had been released due to the lack of complaints. Helena is still waiting for the hospital’s approval to start surgery for skin graft on her missing lip.